Ask anyone about the new generation of social justice music-makers and they’ll mention either Heather Mae or Crys Matthews. Mae, a powerhouse performer and earthshaking vocalist, has turned her personal struggle with mental health and body image into an empowering message of self-love, a universal light force that shines for every audience member. 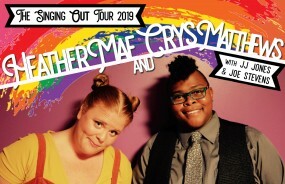 Matthews is a powerful lyricist whose songs of compassionate dissent reflect her lived experience as what she lightheartedly calls “the poster-child for intersectionality.” These two singer-songwriters have joined forces with JJ Jones (Girlyman) and Joe Stevens (Coyote Grace) for The Singing OUT Tour. 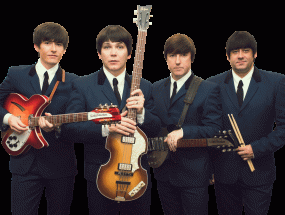 This concert is part The Smith’s Jan Regan Club Series and is also part of The Smith’s 12th Birthday Celebration. 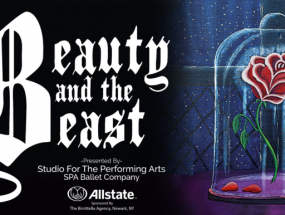 Audience members will share the stage with the artists, so a limited number of tickets are available. This event is made possible by generous support from the Rochester Area Community Foundation Vitality Fund Grant. It is sponsored by Bottomless Brewing. 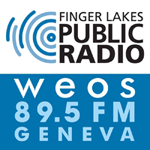 Media Sponsor is Finger Lakes Public Radio WEOS 89.5 FM Geneva. 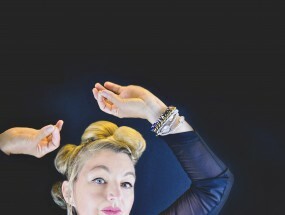 Heather Mae writes music for the light seekers and the good-troublemakers. Delivered via explosive vocals over high energy rhythm-heavy piano, her performances are an empowering, on-fire, musical experience that bursts in the chest of every audience member, moved to their core by her passion and message of self-love and social justice. Her 2016 debut album, I AM ENOUGH, reached #58 on iTunes Pop Album charts without the help of a record label and was an announcement to the world: Mae is the next generation of social justice music. In September 2019 she is adding another title to her resume: mental health advocate. Mae has taken her personal struggle with Bipolar Disorder 2 and Depression and turned it into a record, entitled GLIMMER. With this new record and live show, Mae is a magnetic light force and every audience member is transformed with her anthemic message of hope. 2017 NewSong Music and Performance Competition grand prize winner Crys Matthews blends Americana, folk, jazz, blues, bluegrass and funk into a bold, complex performance steeped in traditional melodies and punctuated by honest, original lyrics. Her two newest releases, The Imagineers and an EP, Battle Hymn for an Army of Lovers showcase two sides of Matthews’ dynamic songwriting: The Imagineers is a selection of thoughtful songs about love and life; Battle Hymn for an Army of Lovers tackles social justice themes. 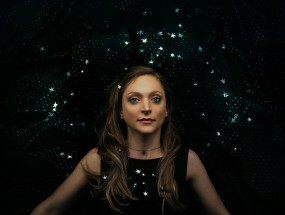 Songs from both projects have already won her recognition and awards including: the opportunity to perform twice at Sundance Film Festival’s ASCAP Music Cafe in Park City, UT; the People Music Network’s Social Justice Songs contest at the 2017 Northeast Regional Folk Alliance; and an official showcase at Folk Alliance International 2018 to name a few. Equally at home in an acoustic listening room as she is on stage at large music festivals, as well as a prolific lyricist and composer, Matthews has found inspiration in her surroundings; from driving through the Blue Ridge Mountains to the compelling and heart-breaking love story of Richard and Mildred Loving. Thoughtful, realistic and emotional, Matthews’ songs speak to the voice of our generation and remind us why music indeed soothes the soul. Sensitive and musical, dynamic and fluid, JJ often seems to be dancing on the drum set. Her constant comment from fans is: “I love to watch you play.” The Americana Gazette says: “JJ mesmerized us that night as she flew deftly across the spectrum of bass, snare and cymbals with impeccable skill. She’s simply one of the best drummers I’ve ever seen, one of the few who uses every percussive surface to maximum advantage.” JJ joined her first band while attending high school at the Seattle Academy of Arts. After graduating college with a neuroscience degree, her long-standing love of acoustic music eventually lead her to play with singer/songwriters and it was then that she started to be known for her signature style. In 2010, she joined folk-pop band Girlyman and found true love. “When JJ joined the group,” Girlyman told their fans, “Our sound got bigger and closer to what we had all imagined it to be for years.” And in 2015, JJ graduated from Berklee College of Music’s drum performance program. She says, “In over 30 years of playing drums, I had never taken lessons or studied with a teacher. It was a whole piece I’d been missing as a musician, and I wanted to step-up my dedication to the instrument.” In addition to touring and recording, JJ gives private drum lessons via Skype to students all over the country, and volunteers at girls and ladies rock camps across the US, teaching, coaching, and facilitating workshops. She is also the Tech and Gear Review Editor for Tom Tom Magazine, the only magazine in the world dedicated to female drummers. She has written multiple articles on drumming technique, as well as reviews of drum gear and educational tools. California-born singer/songwriter and multi-instrumentalist Joe Stevens is a third-generation professional musician in a long line of restless westward moving souls. He caught the songwriting bug at 15 and has been at it ever since. After starting out as a self-taught guitar player and songwriter, he received a Bachelor of Music from Cornish College of the Arts in Seattle, WA, and has been traveling with his music across the US and abroad. Between 2006 and 2012 Joe’s first band Coyote Grace released five well-loved albums and toured with the Indigo Girls, Melissa Ferrick, and Girlyman; sharing stages with Chris Pureka, Greensky Bluegrass, Reverend Payton’s Big Damn Band, and legends such as Cris Williamson and Lowen and Navarro. Joe released his first solo album Last Man Standing in 2014, recorded in Seattle at Empty Sea Studios, co-produced with everything-man Michael Connolly. A dark past and keen insight gives weight to Joe’s words, sung in his signature smoky voice, telling the stories that make us who we are. Joe’s music rides the edge of the first wave of transgender performers to break through into the public consciousness. The social media explosion combined with shifting public opinion created the conditions that enabled trans and queer artists, a highly marginalized and isolated subculture, to connect and gain visibility. There is now a thriving community of trans and queer musicians, with new comers and folks who have been playing music all along, that is visible and growing in every corner of the world.